Kristin Mueller steps into the spotlight tonight (video) | Will You Miss Me When I'm Gone? You know Kristin Mueller‘s name. You’ve seen her name on this blog, and have read about her elsewhere. You’ve almost surely seen her behind the drum kit in many great local, national, and international acts — from Lucinda Black Bear and Gloria Deluxe to Dan Zanes and DBR (Daniel Bernard Roumain), along with some of Cynthia Hopkins’ stage shows. If you’ve seen her play, her percussion skills aren’t even slightly in doubt. 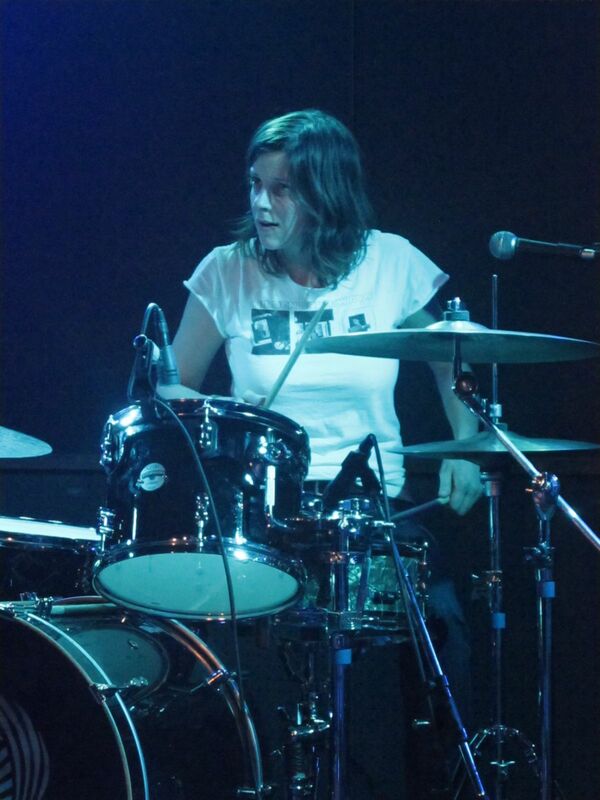 She’s an energetic drummer who is always laser-focused and locked in on her bandmates. But she’s no slouch as a songwriter, either. While her songs exhibit the colors of indie country and pop rock, like many of the bands she works with. But she’s followed her own path, resulting in a distinctive, personal take on the genres. After the jump, read more about where and when Mueller is playing tonight, along with ticket info and links. And her voice, which we generally hear only in the harmony mix, if at all, in other contexts, holds up extremely well as a solo instrument. Her intimate vocals are memorable, often soothing and almost ethereal, but with some pleasing rough edges, giving her a raw sound that is unlike anyone else. While she’s long been part of the scene in Brooklyn, Kristin was based in Jersey City, N.J., until moving to Ditmas Park, Brooklyn, just days ago. You can welcome her to Brooklyn and get a taste of the full range of her talent Wednesday night at Union Hall in Park Slope, Brooklyn, when she and her accomplished band — all accomplished players who you’ll recognize from their work in other bands — perform at 8 o’clock. Mueller’s band is the first of three in the lineup, followed by Bird Dog and The Woes, so don’t be late. Who: Kristin Mueller and her band. Also performing, Bird Dog, The Woes. When: 8 p.m. Wednesday, Aug. 13. Where: Union Hall, 702 Union St., Park Slope, Brooklyn, NY. Tickets: $10 at the door or go here to buy online. This entry was posted in mp3, Music, Pop and Rock and tagged Bird Dog, C Gibbs, Cynthia Hopkins, Dan Zanes, DBR, Deserts & Long Trails, Ditmas Park, Gloria Deluxe, Jersey City, Kristin Mueller, Lucinda Black Bear, The Woes, Union Hall. Bookmark the permalink.